Situated on the exclusive Polarisworld La Torre Golf Resort, with private swimming pool, pool table, PS3 and free wifi, Villa Harienna offers the perfect environment for recreation, relaxation and recuperation. Set in a prime location, near to the 13th and 14th holes of the Jack Nicklaus designed course, this attractive bungalow style villa offers a very high standard of comfort blended with contemporary Spanish design. The villa has everything you need and we pride ourselves on making sure that our guests have a great stay. Feedback and ways to improve guests stay is always welcomed. Fantastic location and a real lovely area of Spain to visit. The summer extends well into November. Great for the family and golfers! Chilling out around the pool, barbequing and playing pool! Free Wi-Fi, PS3 and a DVD library There are some really beautiful Spanish beaches nearby and its great to go out and explore! The first has an en-suite WC, shower and wash basin - whilst the second has a bathroom with shower and WC adjacent Bed linen and towels are provided. All linen provided - Duvets can be provided if required. From the main entrance hall a very attractive kitchen can be found. Equipped with dishwasher, microwave and other useful appliances it offers everything you need for a perfect stay. PS3 and original XBOX - limited games, please bring your own. The villa is situated within a golf resort. A large number of other courses are within the area. Outside: At the front, an outside staircase can be found that leads up to a 1st floor sun terrace. Stretching across the entire length of the property it offers private sunbathing and panoramic views of the surrounding area. There is also an American style pool table with sun canopy for your use. To the rear of the property a private swimming pool takes pride of place against the lawned garden and pergola covered terrace. There is also an outside shower and dining table and chairs which are ideal for “alfresco” dining. Utility Room: With the utility room a washing machine, iron, ironing board and clothes dryer/pegs can be found. Cleaning / Towels / Linen / Maid service: Towels and linen are provided. A pre and post booking cleaning charge is built into the tariff. Mid booking cleaning can be requested, however this is subject to availability and at extra cost. A welcome pack is available on request. Thanks Giselle for such great feedback - please come back soon! Beautiful, well maintained and extremely well equipped villa in a great location. We are a family of 5 who stayed for 2 weeks and couldn't have asked for a better holiday. We took full advantage of using the great pool and roof top sun terrace as well as the ground floor terrace which had lovely seating for 6 and was perfect for a family BBQ. A great base to explore from; only 15 mins by car to Los Alcazares which has lots of lovely restaurants on the main strip and Playa da Horadada which is a beautiful family friendly beach with golden sands and warm sea. James the owner was great to deal with and reassured us that if we had any problems he would sort them out immediately; we didn't have any...it was perfect! We would highly recommend this villa to any family looking for a great holiday!! 5th time here! Home from Home but with the SUN! We keep returning to this beautiful villa and resort again & again. It has everything we need. It is ideal as it has a beautiful pool for all of the family to enjoy and a perfect area to chill out on the patio. Upstairs there is a great area where we have spent many enjoyable hours playing pool. The villa is spacious and having the two bathrooms is a real treat. There are a number of places to eat and drink on site and many beautiful beaches surround this area. We will definitely be back again soon and hopefully for a longer period. We (2 adults, 3 children) stayed at villa harienna for a week in July and we're only sorry we didn't stay longer. This is a beautiful, spacious well equipped home from home. I have to say I'm a bit disappointed with the previous review because when you consider everything that's available it seems very petty. Firstly the pool and garden area. Private pool is fantastic and has a guard (which can be removed) to protect smaller children. We have 3 boys and they never even ventured to the communal pool once because they had their own. The seating area is shaded and has armchair style chairs which are very comfortable for relaxing in. There is also high hedging and fencing for privacy and 4 sunloungers. We've been staying in the area in different homes for the past 7 years and this one was definitely the best well equipped. We cooked and ate in a few nights and the kitchen has all the utensils etc you need. The villa also has high ceilings which keep it cool, especially at night. There is air con but we rarely used it. We've stayed in bungalows and such and they can be very uncomfortable at night with the heat. When it was too hot outside, the boys would move inside and play with the PS3 or use the wifi for a while. They loved that they could still play their games on holidays. There was also the pool table on the roof which we only used at night because its just too hot up there during the day. The resort itself is beautiful and cleaned every day. Its safe and secure with security gates. The supermarket is well stocked and reasonably priced and we ate one night in one of the restaurants on site. If you want to visit other areas you will need a car. We spent an evening in Cartagena which is a beautiful city with plenty to see. We also used the beach at Los Alcazares and because its on the Mar Menor the water is very warm and calm. James the owner has been great to deal with and everything was very smooth. We're definitely going back next year - just waiting for the flights to come out. Thanks again James.......Christy, Francesca and boys. 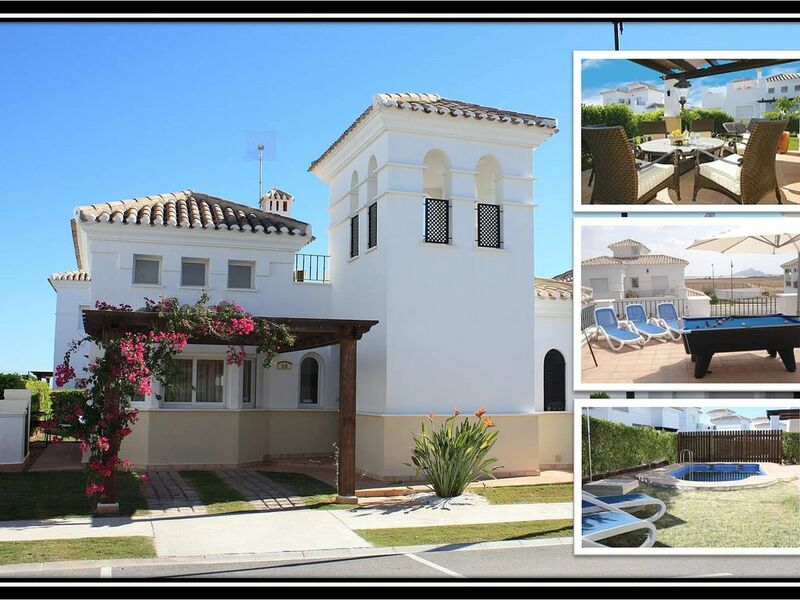 The villa is 15 minutes from the coast where the Mar Menor and other beaches on the Mediterranean can be found. Muria Airport (San Javier) is 15 minutes away and Alicante Airport is 1 hour from the resort. Car Hire is also recommended. Torre Pacheco - 15 mins. Los Alcazares - 15 mins. Murcia City - 30 mins. La Torre Golf Resort is is one of Polaris World's newest resorts and is situated in Southern Spain on the Costa Calida. It enjoys pleasant temperatures all year round and is lovely for a winter break to escape the english weather. The villa is close to the sandy beaches of Costa Calida, and you can easily reach the city of Murcia for a fun day out. Booking Notes: On enquiry a booking confirmation will be sent together with an information pack about the villa, including things to do and see in the area. A booking deposit of 25% is payable within 7 days to secure the booking. The balance is due 8 weeks prior to departure. A cleaning charge of €70 is payable to the key holder on arrival - if the booking is not made through the ownersdirect system. Changeover Day: Changeover days are flexible throughout the week. Notes on prices: Pricing "special deals" are always available - please contact the owner direct.